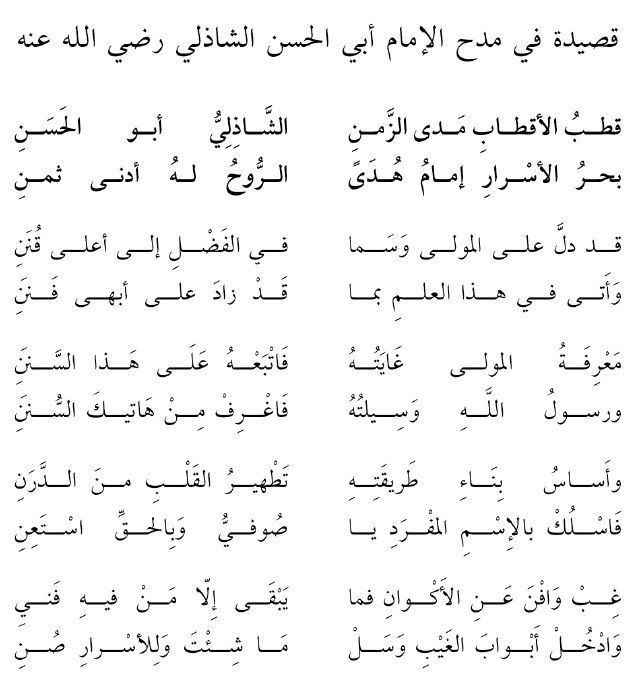 Composed and recited during the Ziyara to the Maqam of Moulay Ibn Mashish Sept 16, 2018 / 1440 H.
This is a rough translation of the poem that I wrote yesterday (14th Aug.) on the way to the shrine of al-Imam Abul Hasan ash-Shadhili, may Allah be satisfied with him and may He allow us to benefit from his secrets and knowledge. The shrine is on the old hajj road in the southern part of Egypt five hour drive from Luxur through a town called Idfu. We were five – four people accompanied me from Cairo. When we were few hours away from the shrine, I found the words coming on my mouth so I jotted them down. When we arrived, I recited the poem before him in the blessed maqam where his presence was felt and it was overwhelming. I spent sometime making du’a for many people and I mentioned most of my student by name. 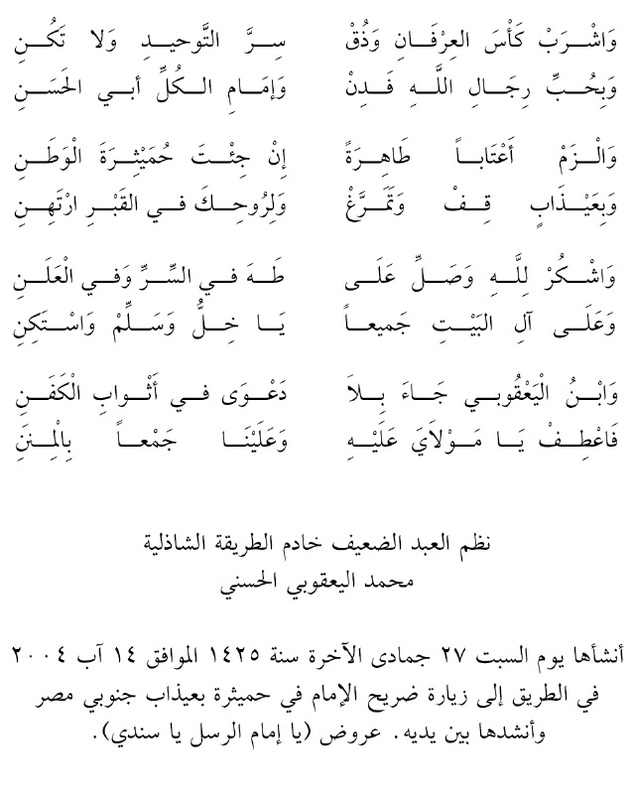 The song in Arabic is written after the pattern of the famous song (ya imam rusli yaa sanadi). The Qutb of all Qutbs throughout times is Abul Hasan ash-Shadhili; An Ocean of Secrets and an Imam of Guidance For whom the soul is the least price. Made it more august than all branches. So, stick to his Sunnas. On the Purification of the Heart from all stains So, journey with the Single Name O, You, Sufi! And seek assistance from Allah. Denna qasida skrevs av Sheikh Muhammad Abul Huda al-Ya`qubi al-Hasani – hafizhahu Allah – på vägen till Humeythira, där han läste upp den inför Imam Abul Hasan al-Shadhili den 14 augusti 2004 (27 Jumada al-thani 1425 H). (att överlämna) själen åt honom är det lägsta priset. som överstiger dess mest ärorika grenar. är hjärtats renande från sjukdomar. o sufi, och sök bistånd hos den Sanne (al-Haqq). om vad du vill, men bevara hemligheterna. av Tawhid – och upphör att vara. och till ledaren över dem alla: Abul Hasan. och lämna din själ som pant i (hans) grav. min vän, sänd fred över dem och ödmjuka dig. och oss alla, i Din välvilja.